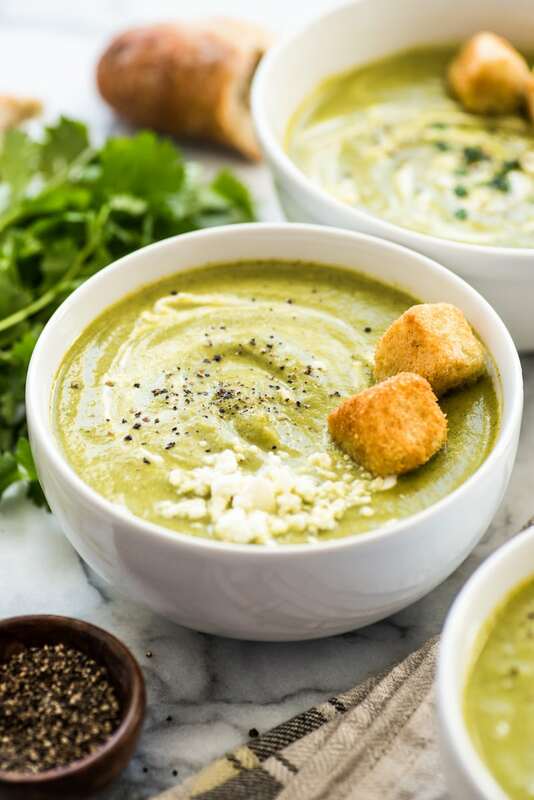 This Roasted Poblano Broccoli Soup is made with roasted poblano peppers, caramelized onions and an entire pound of broccoli for a healthy and comforting soup that’s gluten free, dairy free, vegetarian and vegan! 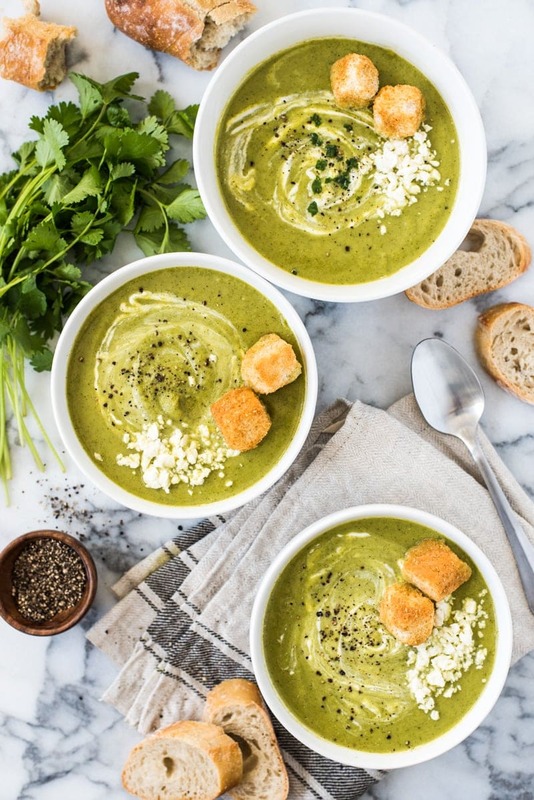 Broccoli soup with a little Mexican flair is officially a thing! 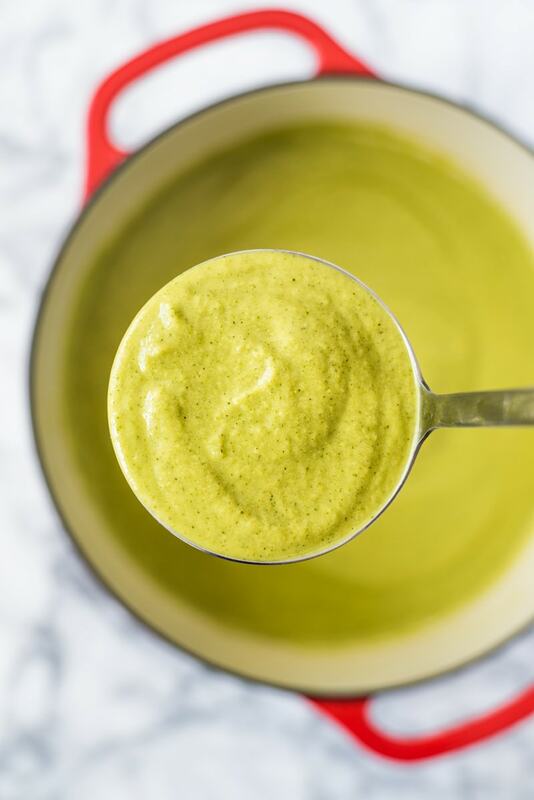 Roasted poblano peppers, caramelized onions and an entire pound of broccoli come together to make a healthy and comforting soup that’s gluten free, dairy free, vegetarian and vegan. It’s pretty much a soup for everyone. Unless your allergic to broccoli or something, in which case you probably felt like the luckiest little kid in the world. For the dairy and gluten lovers out there like me, feel free to add a dollop of plain Greek yogurt, some salty cotija or feta cheese and some big ‘ol crunchy garlic croutons. I forgot how much I loved croutons until I bought some for garnishing this recipe. I love eating them after they’ve sat in the soup for a minute or two. Half of the crouton is soggy and covered in soup and the other half is still pretty hard. Together, it’s seriously the best texture ever. It’s the first Friday of the year and I’m still officially on the healthy food train! That’s a total win in my book. I didn’t set any specific health resolutions this year, but I am trying to cut back on the amount of added sugar and refined flour I eat throughout the work week. The first day was probably the hardest because I really wanted some sugar after dinner. I felt like I could have eaten ALL the sweets I had in my cupboard, but thankfully I grabbed a spoonful of almond butter and was surprisingly satisfied. Now I’m really only trying to stick to this during the week, because I love my weekends. It’s when I like to go out to eat, have some drinks, make a big brunch, bake desserts and all that jazz. I have absolutely no desire to be sugar free on the weekends. None. Gimme all them sweets! 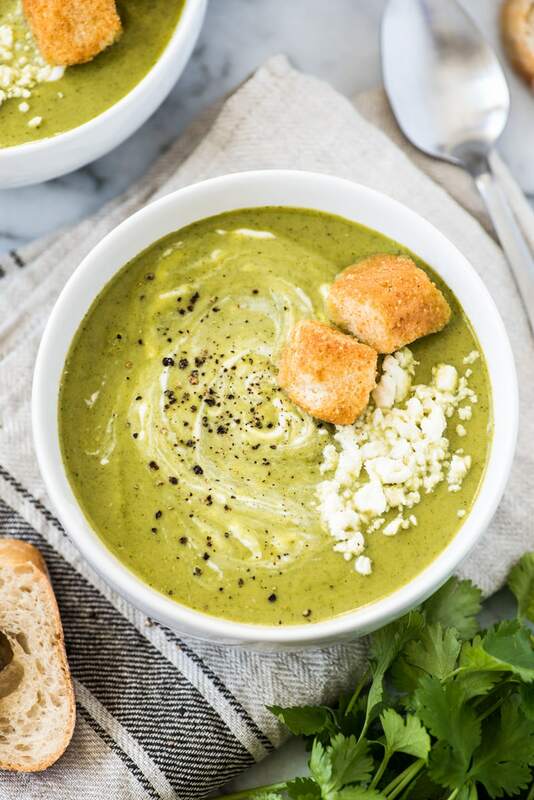 This Roasted Poblano Broccoli Soup is easy to make and all comes together in blender at the very end. The first step is to start caramelizing some onions in a large pot or dutch oven. Cooking them for about 30 minutes on medium until they’re a dark yellow and almost brown really helps to bring out the amazing flavor. While the onions are cooking, roast the broccoli and poblanos in the oven for about 20 minutes. By this point, the poblanos should have some burnt skin that can be peeled off. Carefully peel off as much of the skin as you can and then cut off the tops and remove any seeds and veins. Place everything into the dutch oven along with some broth and bring to a boil. Once boiling, carefully transfer everything to a blender, add some cilantro and lime juice and blend until smooth. Serve with your favorite toppings and dig in! Heat a large dutch oven or pot over medium-low heat. Add olive oil, onions, garlic and salt. Mix together, cover and cook for 30 minutes, stirring occasionally to make sure the onions aren't sticking to the bottom of the pot. Remove from heat when finished. While onions are cooking, preheat oven to 375 degrees F.
Line a large baking sheet with aluminum foil. Place broccoli florets and whole peppers on the baking sheet. Roast for 20 minutes, stirring the broccoli halfway through cooking. Remove from oven and add broccoli to dutch oven. Place the peppers in a large bowl, cover and let sit for 5 minutes. Peel the skin off the peppers as much as you can, cut off the tops and discard the seeds and any big veins. Roughly chop and add to dutch oven. Add 4 cups of broth, turn on high and bring to a boil. Carefully transfer contents to a large blender (best to do this in 2 batches) and add cilantro and lime juice. Blend until smooth. Taste and season with more salt. It will need way more than you think. Serve with black pepper, cotija cheese, a dollop of plain greek yogurt or sour cream and croutons. Enjoy! *Nutritional information does not include toppings. I just made this soup, it’s delicious!!! We don’t have poblano peppers in Australia, so i used two medium jalapeno peppers, leaving a few seeds in. The soup had a nice little kick! I had no idea that Australia doesn’t have poblanos. So sad! I’m glad you were able to use jalapenos though. That’s a great idea! Just wanted to drop you a line and let you know how much we enjoyed this soup! What a standout!! Never enjoyed a green soup so much. The only things we added were cumin to our tastes, smoked paprika (which we add to met of our dishes), and a little more black pepper. Yum Yum Yum!! Thank you so much, Chris! I really appreciate your kind words 🙂 I love the idea of smoked paprika. I add that to many of my dishes, too! I’m really looking forward to trying this out! Your recent eating pattern goals are super realistic and sustainable, too, especially your focus on whole grains like quinoa and brown rice. Beans are also wonderful veg protein powerhouses! None of these are wheat as your post suggests, though…maybe an edit? Ahh yes, thanks for catching that Adriene. How embarrassing! Haha. Thanks so much for reading and for the kind words. I really appreciate it. I try to stick with eating patterns that aren’t too restrictive or difficult to follow. The goal is long term health! Hi, I’m really excited to try this soup. I just have one question, where does the 14g from fat come from? I don’t see it in any of the listed ingredients (except for the optional yogurt or cheese?). Hi Wendy. It comes from the olive oil used, so they’re definitely healthy fats! This soup was amazing; so unique and delicious! I added a bit of half and half before serving. Thanks, Paula! Half and half in this sounds delicious. What a great addition. This looks awesome! Your pictures are totally beautiful too.